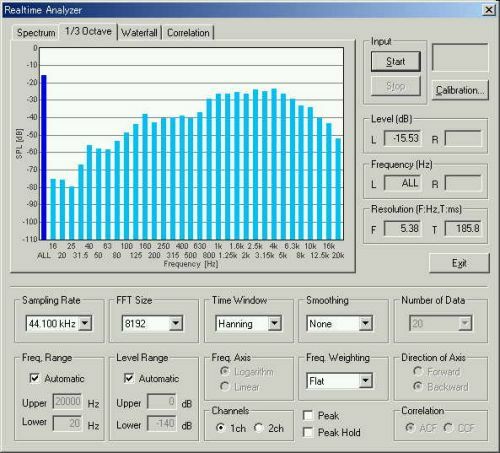 Sound file: 16bit, 44.1kHz, monaural. 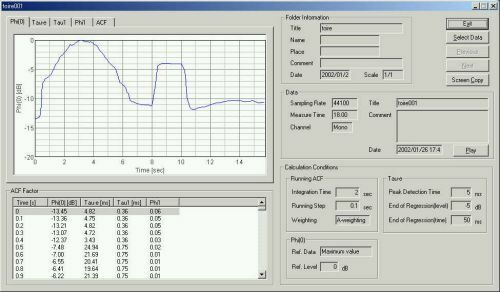 Measured by the running ACF measurement of the Realtime Analyzer. This figure shows the input level when there is no signal. This is the S/N ratio of the whole measurement system. 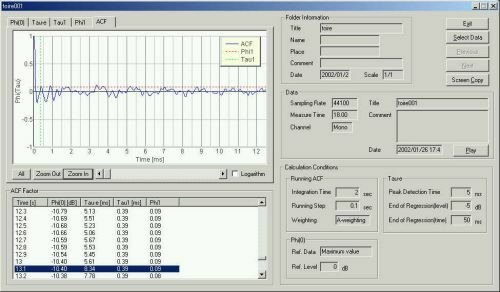 Here is the real time ACF (auto-correlation function) waveform at that time. Now here we have the ACF while the toilet tank is refilling. The ACF when the toilet is flushed. The toilet was flushed 2.0 seconds after the measurement started. Then ten seconds later, the toilet-value was closed. As you can see, the valve closure produces quite a loud noise. After that the sound of water refilling the toilet tank continues. 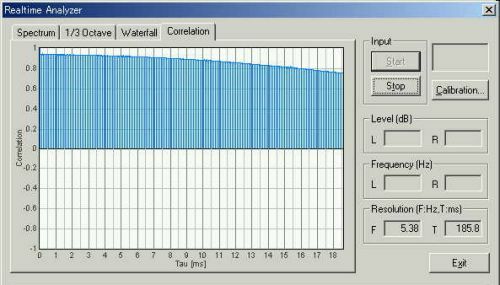 This shows the peak level meter that is close to the maximum volume when the toilet is flushed. And here we have the 1/3-octave analysis for the same period. 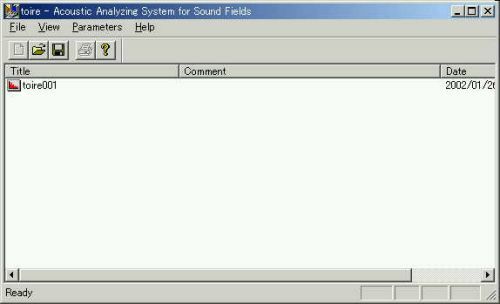 This data was calculated by the Sound Analyzer. This is the calculation condition. This shows the time course of the sound energy for the whole measurement period. It is roughly similar to the real waveform as shown above. The valve opens at 2 seconds and then toilet is flushed, and the valve closes between 8 and 10 seconds. 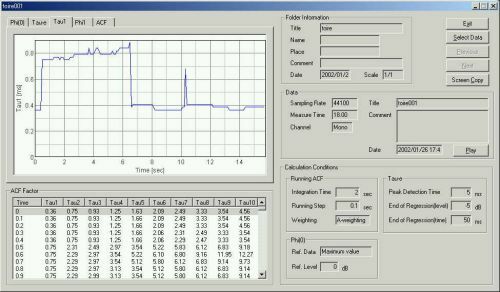 Next, time course of the te value is shown. It can be seen that te becomes shorter during a toilet sound is occurred than for the background noise. 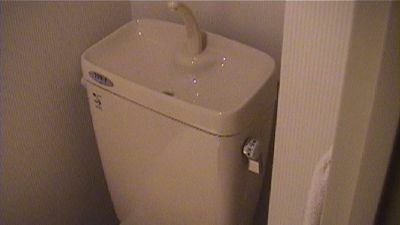 Particularly it becomes the smallest when the flush valve is opened (2.5 s) and closed (8.0 s). It seems that a small te is found when some noise event occurs. 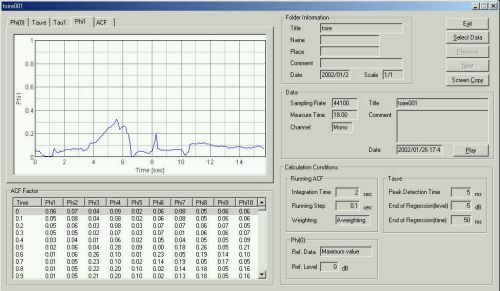 Next figure shows the time course of the t1 value. It represents the fundamental frequency or pitch frequency of noise. It is 0.8 ms (i.e. 1000 / 0.8 = 1250 Hz) when the toilet is flushed, and is 0.4 ms (2500 Hz) when the tank is refilled. The pitch strength, f1, seems correlated with loudness. The louder the sound, the stronger the pitch. We found that the pitch strength was relatively constant when the tank was refilled. 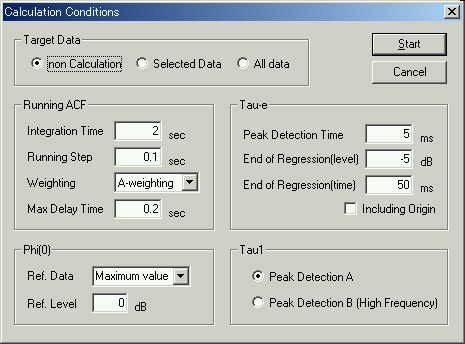 This shows a stable autocorrelation function (ACF) when the tank is being refilled. 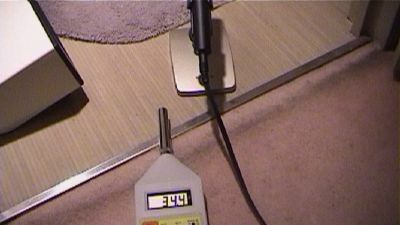 The background noise is 38 dB, and the maximum of the toilet noise is between 68 and 70 dB. The sound of the flush-valve closure is also quite loud, generally exceeding 65 dB. The sound of the tank refilling is about 55 dB. 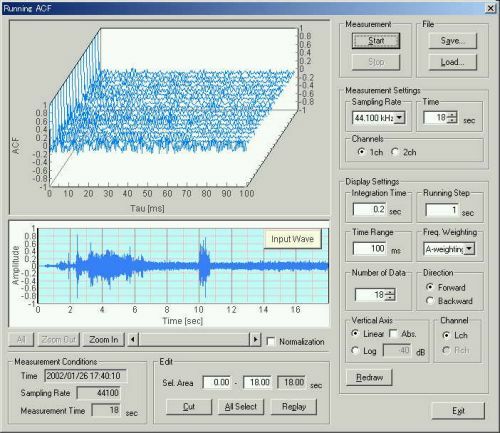 In this measurement, the averaged sound level for 2.0 s was calculated in every 0.1 s. If the averaging time was shorter, the more detailed activity should have been observed. 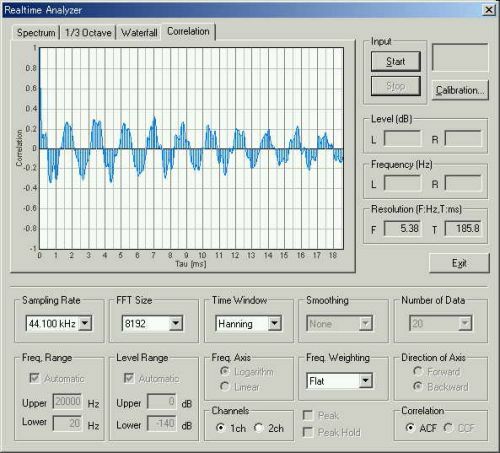 Pitch of flushing noise was found to be 1.2 kHz (t1 value of 0.8 ms), and 2.5 kHz (t1 value of 0.4 ms), while a tank is refilled. 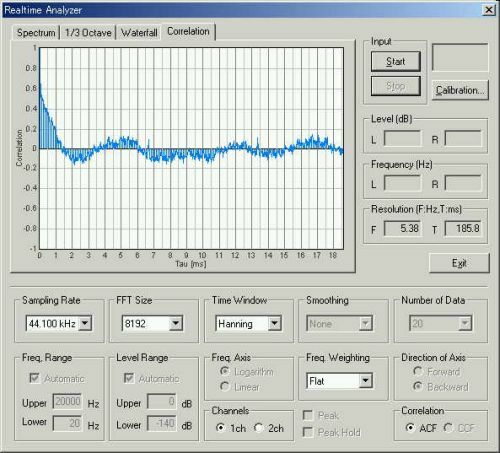 Pitch strength was correlated to the sound level. The louder the sound, the more clear pitch was perceived.